Can one person really die for the sins of everyone? It seems that when it comes to the concept of Jesus dying for our sins on the Cross, many people can’t get their head around the concept. How could one man die for all the sins of all people? People say things like “If Jesus was God couldn’t he just say you are forgiven?” Perhaps Jesus could have done this but I think there is more to it than that. The Cross is a sign of a greater reality. God could have used a different sign but instead God chose the Cross. When the Israelites were giving sacrifices to God throughout the year they would give the sacrifice on the outer altar of the Tabernacle (Exile) or the Temple (Jerusalem). 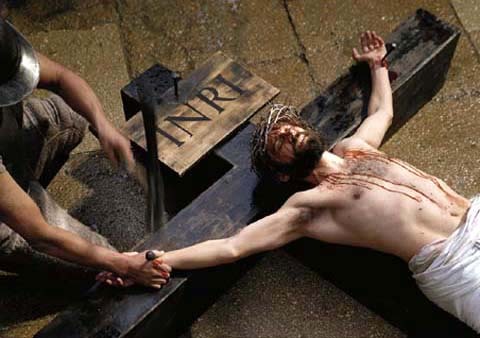 They would take an animal and place their sins on the animal then sacrifice this animal as a “payment” for their sins. Throughout the year the Tabernacle or the Temple would be “contaminated” by the sins of all the people so the High Priest would enter the Holy of Holy’s to make a once a year atoning sacrifice to cleanse the Tabernacle or Temple. The Jewish People in the time of Jesus would understand that one High Priest could make a sacrifice for the sins of everyone because they saw it every year. Given that modern day Christians don’t have this sacrificial system, we may not understand this imagery. But for the Jewish people of the day, they could believe that one man can pay for the sins of everyone. Big Business – Today when a company is found to have done something illegal or wrong, the “market” calls for the CEO to resign. The press will wage a campaign to have someone pay the price for the misconduct of the entire company. The CEO might send someone else to take the fall on behalf of the company but someone has to pay. After one person has resigned it seems that people continue to do business with this company as they everything it back to normal. When one person pays the punishment the company gets a new start. Criminal system – it seems that when the media find out there is a mass murder who has killed many people that justice isn’t served until they have been locked up in gaol. Or perhaps people want the death penalty, even in a country without the death penalty. Even though the murdered victims will never come back again, justice is seen to have been served when one person has received their punishment. Sporting teams – it doesn’t take long for fans to cry for “blood” when their beloved sporting team continues its losing streak. In AFL crazy Melbourne people are already making accusations about certain teams and it is only week two of the season. How often do we see fans get back onside when the coach or captain is made to resign to “start a new chapter”. How can the loss of one key player or a coach turn around a team and yet the fans seem to have a new hope. Perhaps you might get the parallel that I am drawing with the issue of Jesus dying on the Cross for the sins of everyone. Even in our secular non-christian society we have examples where “Justice is served” when one person takes the fall for the sins of many. How much more powerful then is the example of Jesus who is the God who was sinned against, taking on the punishment for the sins against him? My hope is that this Good Friday is a time for you and your family to see that God has paid the price for our sins so that we can live in freedom. Not just a once a year payment or sacrifice like the Jewish people believed in but a once and for all payment. Not just a scape goat punishment like in business, criminal system or sporting teams, but full restoration in our Hope because of Jesus.